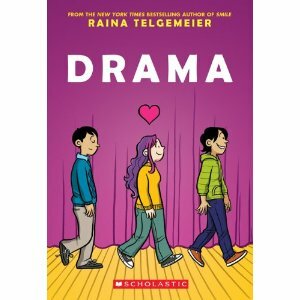 Drama by Raina Telgemeier. Graphix (Scholastic Imprint), 2012. Currently available. Face Value: We love this cover because we loved the book, the cover perfectly exemplifies it. Graphic novels often have great covers, because the author is already creating a visual image for her characters in world – there’s no way she wouldn’t be involved in the design process. So like the book, the cover perfectly captures middle school, romance and theatre – everything we’re about to get in the story. Also – that title hits everything. Drama, in every sense of the word is the only appropriate title for this book. Um, hello? While many of us emerging theatre artists found ourselves in crew because we didn’t get cast, that couldn’t be farther from Callie’s situation. She is in love with set design – that is her art form and first choice. To suggest otherwise does the character a disservice and betrays the uniqueness of this story. Does it Break the Slate? There’s no question. Not only does it show us the story of a middle school girl navigating confusing crushes in a self-determined way and young women with an artistic vision and the skills to back it up, it also presents multiple ways to look at the process of coming out in a totally elementary and middle school appropriate and accessible way. Who would we give it to? This book should be mass distributed to elementary and middle school drama clubs and to those adults who were part of those clubs at one time. As theatre artists since childhood, we both related to this book in an all encompassing way. But you don’t have to love theatre to love Drama .The characters and emotional resonance will transcend the admittedly specific (and well researched) stage crew experience. Review: And we’re back with a joint review! There’s no way one of us would completely cede the right to review this book to the other one. So a joint review it is. BRIANNA: The middle school drama club experience is unusual, in that it is very specific in its culture but also in a beautiful way, something everyone can relate to – this idea that this is the only place where I belong. Raina Telgemeier’s last book was autobiographical – this one isn’t, but it shows how she’s able to create that same level of believable empathy in a fictional story. SARAH: Plus, even if she isn’t writing about her own experiences, she clearly has been around a stage crew at least a few times, because the details of the culture are perfectly captured. For example, the stage manager calls cues correctly and that attention to detail is portrayed with the same attention to detail that it would be in reality. BRIANNA: I love that one of the first glimpses we get of the stage crew experience is so youth driven, that they young people are expected to take on big challenges and solve design problems on their own. SARAH: The sense of ownership that all of these kids feel is so clear. They are treated like professionals and the value of succeeding is presented as being as important as being onstage would be or as excelling in sports, academics, any of the more frequently featured examples of middle success. BRIANNA: Raina Telgemeier is probably one of the best capturers of middle school girls’ emotional experiences because she nails not only the situations but the physical reactions through facial expressions, body language, etc. so perfectly. Check out the animated book trailer for examples of her beautiful expressive drawings. Telgemeier’s illustrations are vibrant even without the animation, and the trailer gives a sneak peek at the wide eyes and blushing faces of her middle school characters. SARAH: Callie is a particularly great example of a middle school Slatebreaker because she is both confident and capable while still experiencing moments of insecurity and self-doubt, just as an actual middle schooler would. BRIANNA: Yes, and her crushes are not all-consuming. She’s discovering that she’s a girl interested in boys and that is present in her life, but so are many other things. It never overtakes the importance of her interest in design. It might become intertwined, but it never interferes with her art and her own interests. Plus, we see her learn and grow from her experiences. SARAH: Something else great about the book is that Telgemeier is very intentional in the diversity of her characters. We see characters on stage crew of all races in a way that is embedded into the storytelling. Girls and boys are part of every aspect of the play production and its just as acceptable for a girl to build things as it is for a boy to sing. BRIANNA: There’s also a specific focus on characters who are gaining understanding of their sexual identities and orientations. There are several gay characters and its clearly presented that there’s no “right” way to come out. It’s about discovery and comfort level and identifying who your support system is. When Justin comes out to Callie, he’s demonstrating that he trusts her. And Callie gives us a great model for how to be an ally. SARAH: Yes! I love the way the characters in this book are allies. We don’t actually see a lot of prejudice being demonstrated, which might be considered an oversimplification but I don’t actually see it that way. I see this book as being a model for positive response, and I find that the Stage Crew / Drama Crowd is a typically accepting group in most schools. BRIANNA: It reflects the perceived and often true atmosphere of drama clubs as being a safe space in a school. Now, let’s talk about the cannon. Because sometimes, when you’re a grown up and you have to tell kids that there isn’t money the budget for something or they can’t do it for some reason, it’s not fun. So when Callie takes the “no” on building the cannon and turns it into an opportunity to show her creativity as a designer, it makes the drama teacher in me feel really good. But in addition to that it shows a smart girl taking the resources that she has available and make it work. It also leads to the necessary amount of hilarity when things go disastrously wrong during the performance. SARAH: Yes, and those disasters are not failures, they are part of the ultimate successes and the hilarious horror stories we all have from theatre productions we’ve worked on. There are so many brilliant and Slatebreaking moments of discovery in this book. We want to share them all here, but we also don’t want to ruin that element of discovery for readers. But truly, there’s a lot to love about Drama. Revewed from copies purchased at Fireside Books and A Room of One’s Own. This entry was posted in Graphic Novels, Middle Grade, Reviews and tagged drama club, Graphic Novel, Joint Review, LGBTQ, middle school, Raina Telgemeier, tech crew. Bookmark the permalink.